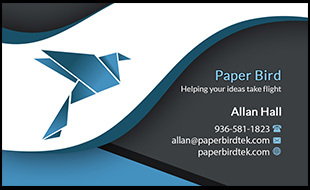 Paper Bird Tek is a website and project I created to allow me to do things outside of my normal “day job”. This means primarily donating my time to select non-profit organizations for a wide range of IT tasks, and writing to help everyone learn about and use today’s technology. So what is a select non-profit organization? First, you must be a 501 C3 certified organization. Next, I do not work for groups that have a large pool of volunteers already available (such as churches, schools, etc even if they are non-profit). My goal is to help smaller organizations that often get overlooked and are consistently short staffed. Some examples include, but are not limited to, animal shelters, women’s shelters, boys and girls groups, private museums, etc. Being one of these groups does not mean I will do all of your IT work for free, or even any of it. I do what I have time for, for groups I believe in. Why am I so picky with the groups I help? Because I believe that if I am giving up my free time that I could be spending with my family, it should be important to me. Besides, don’t you believe someone should be able to choose where they donate their time? Me too. If you need something done and it is not specifically listed on this site, contact me using the contact link at the top right of the page anyway. I will either be able to help you, or refer you to a place that can. 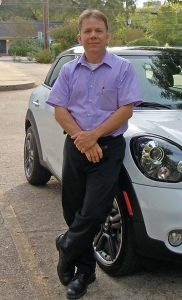 I work in and around Walker County Texas. If you are close, drop me a line using the contact link in the upper right and I might can help you. Lastly, if you are technically minded and want to volunteer your services to worthy organizations but don’t know where to start, contact us! We would love to help you find that special opportunity to help others. I started on my journey with computers back in 1980 on a Radio Shack TRS80 model 1. My seventh grade school had a single pilot computer class that ran for a six week period, or maybe two. In that class I learned the basic programming language and even more importantly that I could make a computer do what I asked it to do. From there I went on writing for the TI-99/4A, Apple IIe and IIc, Commodore VIC20 and 64, and finally into DOS based PCs. I even worked with some very early Macintosh computers (not a Lisa unfortunately) but never wrote any code for them. Yes, that’s me much younger in life, hair and all. By the late 1980s I was very into DOS computers including building, repairing and programming them. I was fascinated with BBSs (bulletin board systems, the predecessors to the internet) and ran up quite high phone bills. I even helped run one BBS and created my own small BBS on a VIC20. For many years I helped organize and even became president for several years of the Conroe Huntsville Users Group, CHUG. This group met monthly to talk about technology, show off the latest hardware and software, and play games. There were several Special Interest Groups within CHUG which were sections devoted to a particular topic. Examples included the Apple SIG and the OS/2 SIG. The Apple SIG was officially recognized by Apple and enjoyed special discounts through Apple on both hardware and software. The OS/2 SIG was officially recognized by IBM and Team OS/2 and received gifts, materials and training. In the 1990s I actually started running my own larger BBSs on a variety of hardware and software. Eventually this led to a system called Pawn To King’s Four (PTK4 for short). This was a three line (four at one time) system where all the lines could chat and play games with each other. In addition the system was linked with hundreds of other systems around the world exchanging both public forum messages and private messages internationally. Eventually this even linked into the internet providing internet email and messaging to people, providing their first internet access. 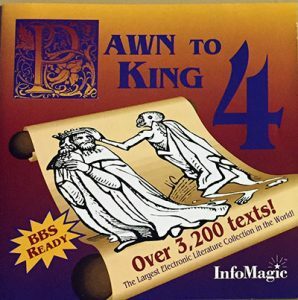 The CDROM published by InfoMagic. This system was referred to as an Online Information Service (OIS, a term I coined) instead of a BBS. I invented this term because the system was much more than any other system I had ever heard of. Even though systems such as AOL and Compuserve were far larger and had tons of resources, I had the “World’s largest online library”. Indeed I had thousands of books, more than Project Gutenberg at the time, and they were all indexed with Author, country of origin, style of writing and much more information for each title. I even had a full time librarian. This library was eventually published on CDROM and distributed worldwide by Infomagic. 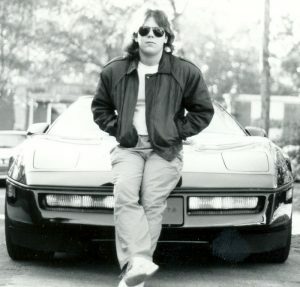 While running the OIS I wrote custom software to make it easier to use, SearchLight SysOp/2 (Searchlight was the name of the software that ran the OIS, SysOp stands for System Operator or the person who runs the system, and the “/2” designated that it was an OS/2 program, I called it SLS/2 for short). It worked so well I decided to release it publicly and see how it fared with other people using it. The response was quite good. This also required that I take the skills I learned writing the help documentation for the OIS and hone them to write the documentation for this software. In the late 1990s CHUG was dissolved from lack of interest in the community as everyone moved online for their information. Around that time was when I joined the Houston Apple Users Group, HAUG. I remained a member there for some years. In 2000 PTK4 was permanently closed and archived. It was a sad day as the system had been such a huge part of my life for the past ten years. Computers continued to be a large part of my professional and personal life even without the OIS or user’s group. I started working for a company called Syscomm Computers here in Huntsville. We built custom PCs, repaired all makes and models of PCs and Macs, did networking and a little programming (primarily database work). The vast majority of our work was general PC repair both on site and in shop. Syscomm did not fare well as a company. The original owner sold out and the new owner did not seem to want to put the time in to remain current and there was too much competition for it to remain a half hearted effort. When the paychecks started becoming “problematic” I decided to start my own company, and Falcon Technologies was born. For many years I ran a pretty successful company. It did well enough to send myself and my wife to Las Vegas six or seven times in just a few years. The problem I had was one shared by most small business owners, the ups and downs. We could be rolling in cash for six months and then starve for the next three. I never managed to get the company large enough to balance everything out. Whenever I made money I had to put a large part back to be safe. That got really old. I then moved on to become the Chief Information Officer for a company called Educational Video Network. This multi-million dollar corporation had somewhere near fifty people on the payroll and I was in charge of all things technology related. Working there I and one other person wrote the database that ran most of the company. The database was written in Microsoft Access as the front end and Microsoft SQL Server on the back end. From order entry, shipping, royalties to inventory, this software ran it. In fact, other than actually creating the videos and payroll, there wasn’t anything it did not do. This was used to replace their aging Alpha Micro system and required that I learn Alpha Micro so that I could export the data out of the old system and import it into the new. I was also in charge of maintaining the Apple systems used for video production and drawing up the specs, purchasing, setting up and working with their first ever DVD production machine. I also worked with the time clocks, internet connections and setting up their Mac OSX web server. This server was the first generation of OSX servers, the very first version 10.0. I took a completely factory computer and wound up having it run over a hundred websites. Eventually this Mac was replaced by a Red Hat Linux server I custom built which wound up hosting close to five hundred websites. That was a huge thrilling and challenging project. After a while there I left to once again run my own company. I was not really thrilled about this so I immediately started looking for employment. I found a company just getting started but that had lost one of its two founding techs. I hit the ground running and have been there for over eleven years as of this writing. What started as two techs and one woman in the office has expanded to five techs and three women in the office. The company either partially or completely manage three school districts, many city and county government offices, and hundreds of businesses and personal customers. Working there I have run network cabling, built and installed large network servers, designed and built databases running multi-million dollar corporations, built websites (although they don’t do that any more), written hundreds if not thousands of pages of technical documentation and much much more. They now even repair devices such as phones and tablets. Since I now had way more experience writing technical documentation than I ever wanted and I had written a couple of short how-to documents about my astrophotography hobby, I got talked into writing my first astrophotography book in 2013 called Getting Started: Long Exposure Astrophotography. This did much better than I thought it would and so I decided to write some more. 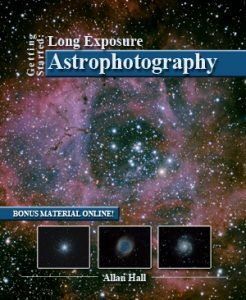 The next few years produced many titles including Getting Started: Budget Astrophotography, Getting Started: Visual Astronomy, Non-Fiction Publishing and Marketing for CreateSpace and Kindle among others. Many of my books are available in both print and electronically from Amazon and Apple. If you are interested you can always keep up to date with all my books on my personal website, www.allans-stuff.com. It also has tons of information on my hobbies including how-tos, reviews, news and much more. Today my interest and use of technology is as it has always been, substantial. I have Macs, Windows PCs, Linux machines, both IOS and Android tablets, Surface Pros, Netbooks, and Chromebooks. Most days I even carry both a Samsung and Apple phone with me. After all, if you don’t use it constantly, how can you work on it? I still do some coding, still do some websites, and still do some of the really esoteric things only the weirdos do. I have gotten into some interesting hobbies such as amateur radio, astronomy and astrophotography, and I continue to write books on a variety of topics. If you want to be really bored you can even come hear one of my lectures at the North Houston Astronomy Club or the Huntsville Amateur Astronomical Society. I also have fun adding technology to my house through Amazon’s Echo, wifi enabled thermostats, streaming security cameras, NASs and more. Don’t think my vehicles get left out either, they are pretty loaded with their own technology, both factory and aftermarket.